My Face Is Clear For The First Time In Ages, So I Am Writing About It! This seriously needs to stop. Currently I'm taking D3, Omega 3, coQ10, C, zinc & beta carotene with E. I eat pretty healthy- lots of leafy greens like baby spinach & all I drink is water or green tea. Still have very congested pores. I'm also currently using Diacneal, which has been somewhat effective at reducing oiliness. Is there anything else I should be doing??? Anyone who got rid of their congested skin/blackheads?? Thanks in advance. Doesn't Seem To Be Working.. Any Suggestions? My body doesn't convert Beta Carotene to Vitamin A very efficiently. Any tips? I keep hearing "Lol careful /w vit A the limit is lik 10,000..." Well. My multi-vitamin (mind you, I haven't taken it yet) has: 15,000 IU Beta Carotene 10,000 IU Retinyl Acetate ?!? Getting Worse Before Getting Better? 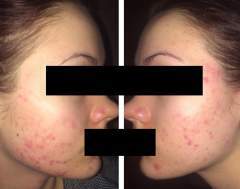 BREAKOUT FROM MILD GLYCOLIC PEEL?